Freckles 19's Story . . . 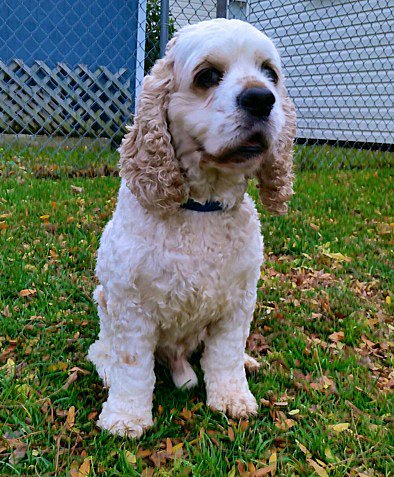 When Freckles Pennsylvania owner died, he could not stay with the family that was temporarily caring for him, so this parti-colored Cocker became a MAESSR boy. Initially being told Freckles was only four years old, it was discovered through paperwork that this boy was much older. His vet visit also revealed the teeth of an older dog and evidence of knee problems. That, however, does not slow this guy down! When Freckles got to his foster home, this former stud dog properly introduced himself to the resident female Springer girls, and put himself in charge of the household. He adores the cats in his foster home and is best buddies with the neutered tom in the house. However, any other intact boys-- feline or canine- that have come through are constantly reminded of who was here first! Nothing seems to bother this confident little guy and he protects his “turf” like a big dog. Freckles is good going for walks and loves meeting new people. This boy enjoys car rides either crated or on the back seat. Freckles’ house manners are good, he is too short to counter-surf and doesn’t get on the furniture. When it’s time to sleep, he’s happy with a dog bed or crate to curl up in. He has not been given the chance to trash dive, but being a spaniel, if it smells like food, it’s fair game. And speaking of food, Freckles LOVES his bones. He gathers up bones left by the other dogs and hides them under the bed. Woe to the critter who tries to take one of his precious bones but he lets his mom “exchange” one for another treat. Freckles is very good for grooming, standing patiently until his haircut is complete; the same goes for bath time. At his vet visit, Freckles was quite the charmer with his big brown eyes and merry wagging tail. This pint sized pup will win some lucky family’s heart. All in all, Freckles is a great little dog.